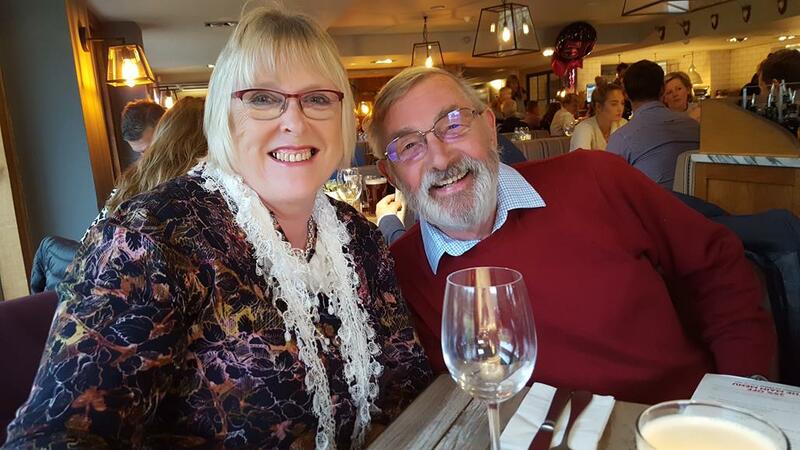 A quick update on what we have been up to since we returned to dry land apart from the usual round of appointments (dentist, doctor, hairdresser, optician etc), laundry and finding homes for all the 'stuff' we brought back from the boat. Suitably attired he exterminated them - I am glad to report his efforts were successful. Saturday 13th October we all met up as a family to celebrate a birthday. We had a long table in the corner which was great, but rather dark when it came to taking photos, so I don't have many good ones. The meal was excellent and the staff very attentive. and their sister - a very pensive looking Evelyn. It looks as though she is looking at some sort of electronic device, but that was not the case - they are not allowed at the table and long may that continue. Our son, Mark and daughter in law, Jo - Mum and Dad to Molly, Noah and Evelyn. Sarah's eldest son, George with our son in law in the background. I failed to get a better one of Paul. The weather had been good all day and we had a great evening. This was our first evening meal out together - manageable now that Jamie is that bit older. We spent time together on the Sunday, but huddled inside - the walks were abandoned due to torrential rain! The only other event of note was Monty having to go 'under the knife'. He has a history of lumps and has had two removed in the past which were sent for analysis and came back as benign. When a new one appeared early this year on the top of his head near to where his collar sits it was decided (in consultation with the vet) to leave well alone unless it caused problems. Over the summer it grew and was catching on his collar and bleeding, so it had to go. In the meantime two others had appeared - one under his right front 'armpit' and the other just above where his tail meets his bottom. Surgery was performed last Monday, so he still has his stitches in, but he does not seem in the least bit bothered by any of it. At his post op check we got the okay for him to be off the lead as long as he was not allowed to bounce around with other dogs or chase a ball. I really thought he would look very odd with three bald patches and a fourth where the cannula goes in, but he has so much fur around his neck and bottom that those holes are not visible at all. It is just the cannula spot and under his right front leg that look a little odd. And so back to boating. 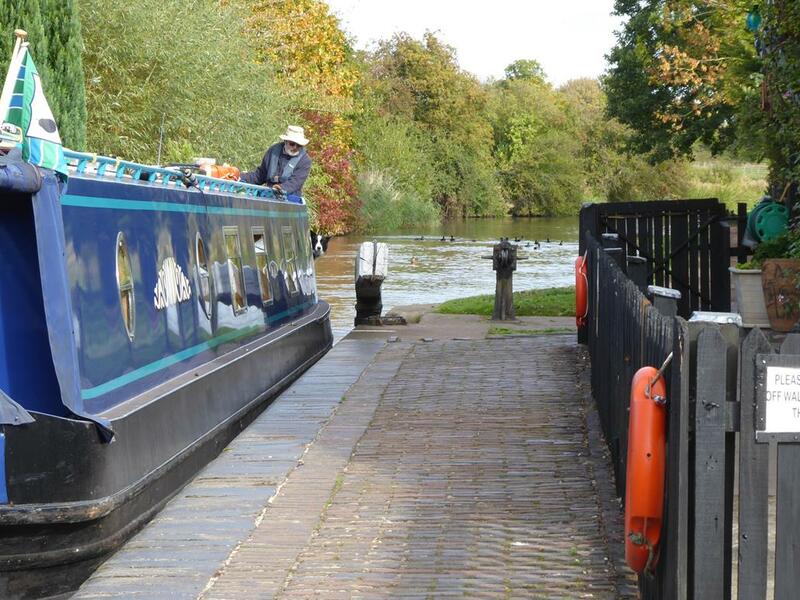 Tentatrice is booked in to have her bottom blacked commencing Monday 22 October, so just seven miles from Droitwich Spa Marina and a mere 45 locks!! With food and clothes for just one night, we left home Saturday morning heading for the marina. All was quiet in the next morning and we were ready to leave a little before 11am, but horror of horrors, suddenly the marina spun into life with not one, or two, or three, but four boats leaving just as we were untying our ropes! We would be turning left to go up the Hanbury locks. Sadly so were three of the four ahead of us! 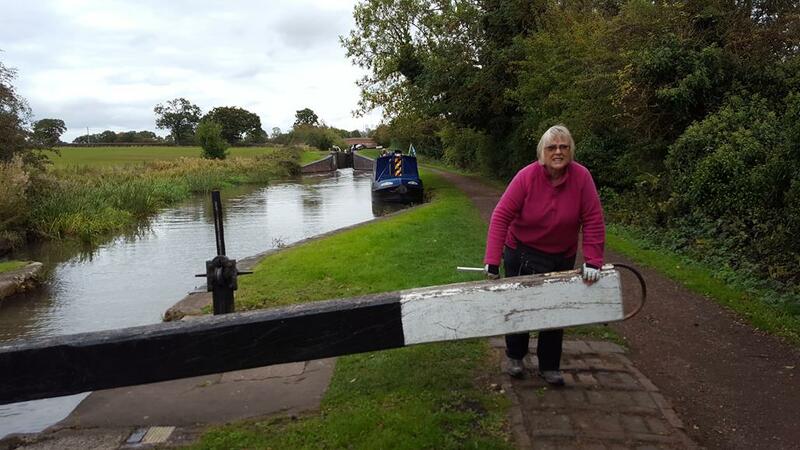 There were two volunteer lock keepers on duty, so it was all as efficient as it could be, the weather was clement (misty, a little chilly, but dry) we were not in a hurry, so no problem and time to enjoy chatting to fellow boaters and the VLKs. By the time we got into the first lock there were three more boats behind us. I had managed to ascertain that the three boats ahead of us were turning right at Hanbury heading towards Worcester, whilst we were turning left. 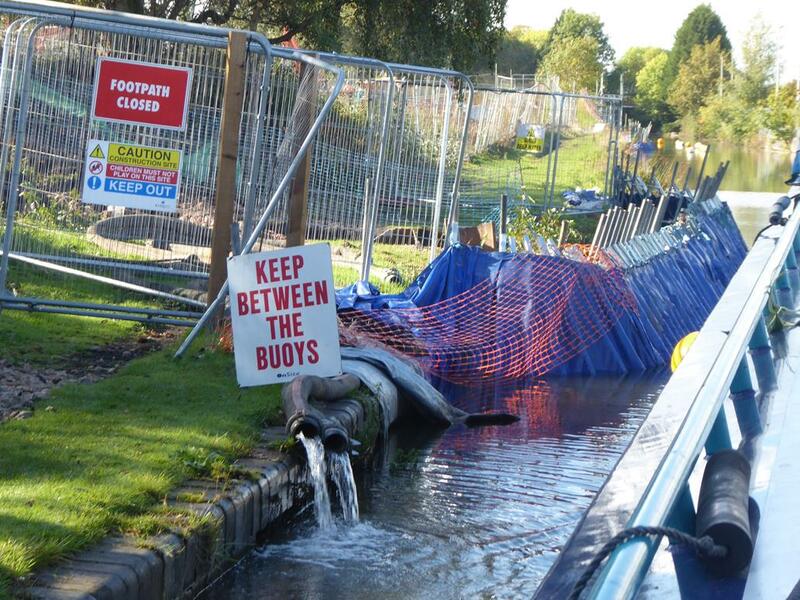 We did hope that would mean there was no one immediately ahead of us for the next 12 locks. 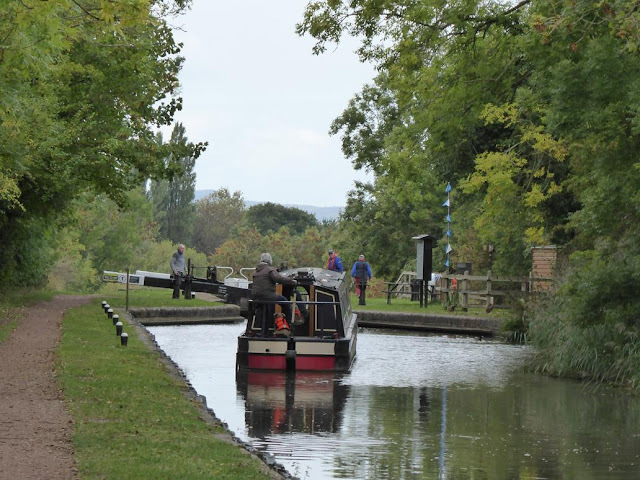 The next flight is the six locks at Astwood and joy of joys as we arrived a boat was exiting the bottom lock - all six locks were empty, so a very easy run up for us. It has never happened before and probably never will again, but we were grateful. 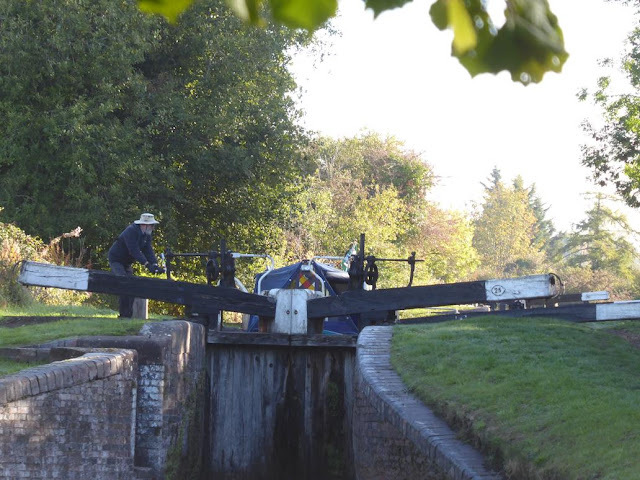 The next flight at Stoke Prior also has 6 locks and lo and behold as we approached the first one there was a boat coming out! Would they all be ready for us? Sadly not as there was a boat going up the next lock ahead of us, but I guess 7 out of 12 locks in our favour was pretty good going. When we arrived at the Queen's Head in glorious sunshine there was a 21st birthday party going on in the Teepee and also being Saturday night we wanted to be as far away from the pub as possible. 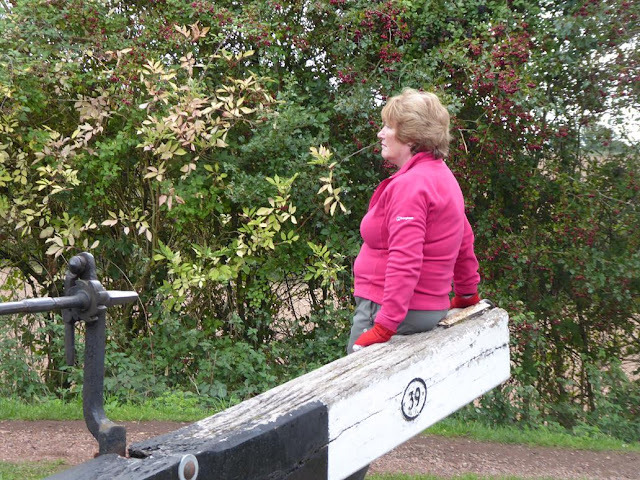 It was all rather crowded, but we managed to squeeze in at the far end before the first of the Tardebigge locks. Although the day had been lovely the fire had been lit and we were grateful for its warmth on what turned out to be a chilly night. It was a typical misty Autumn morning, but with the promise of a decent day ahead of us. You can see by this misty photo that we really did have to squeeze into the last mooring - stern button to stern button with the boat behind us and even then we were overlapping the lock moorings by a few feet. Not something we would usually do, but there was still a lot of space for anyone else who needed to use the lock landing. Late afternoon a cruiser came and moored there overnight, but to give him his due he was off at 8am. 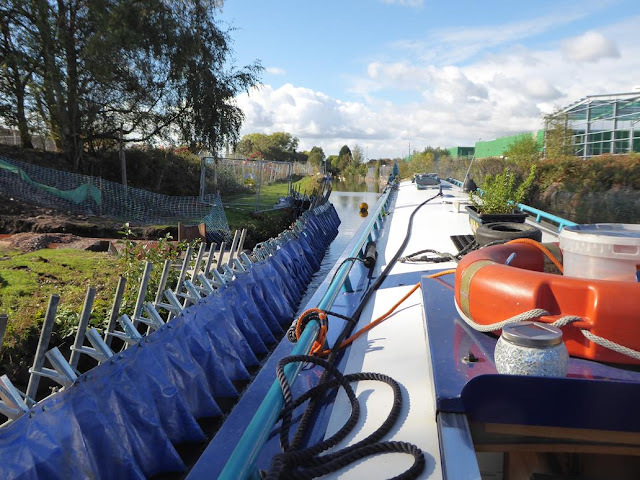 We knew that the cruiser would be ahead of us, possibly another who had gone through the bottom lock late afternoon (you can moor overnight a couple of locks up) and another (nb Ernest) moored further back, but we were waiting for family reinforcements, so were in no hurry to get going. Our daughter, son in law and their two boys were coming to lend a much appreciated hand - well eight hands! Ernest set off a short time ahead of us and with so many crew on our boat it was not long before we caught them up. 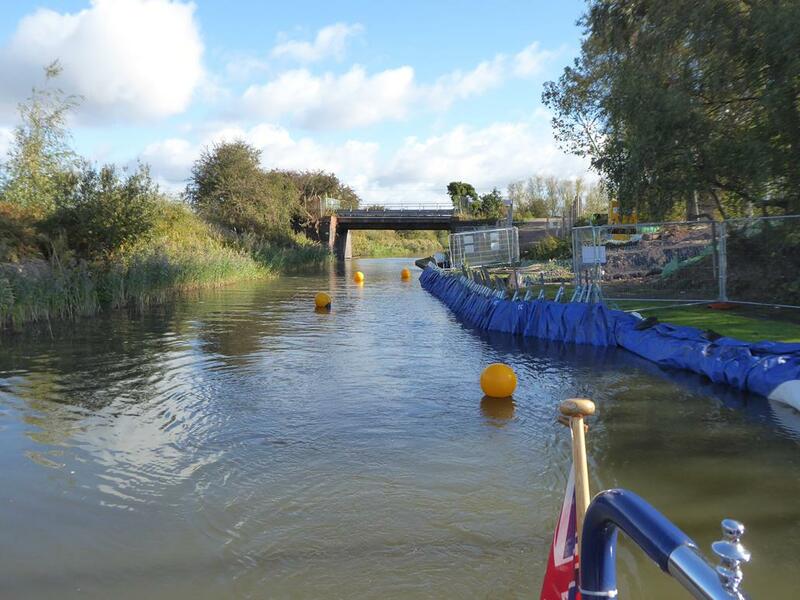 Jamie and I went ahead and offered to lock ahead for the Ernest crew - an offer that was gratefully received. We had many and varied conversations in our hour or so working together. I discovered his maths is pretty good as well - he asked me how many stitches Monty had had. I said I was not sure, but probably 3 at each site - as quick as a flash he came back with a total of 9! As time went on the need for sustenance was apparent - he was 'starving'! 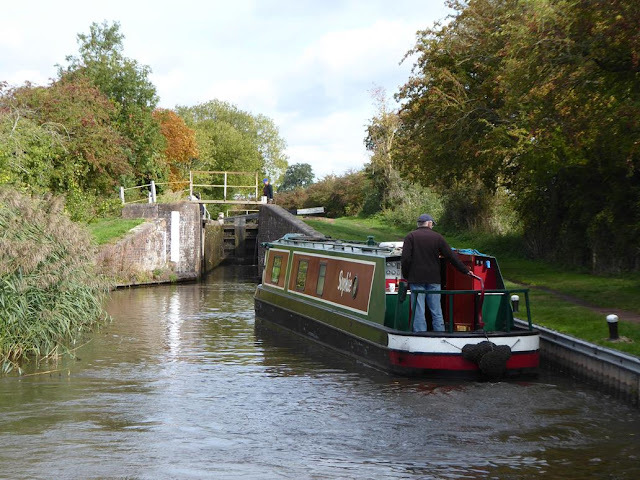 We left Ernest to it (we were over half way by then) and went back to Tentatrice where we all took a short break in a lock for a quick lunch. The boys raced up to the top of the reservoir - I snapped a picture of George and something really odd has happened as there appears to be two of him! in fact it looks as though someone has taken the plug out! 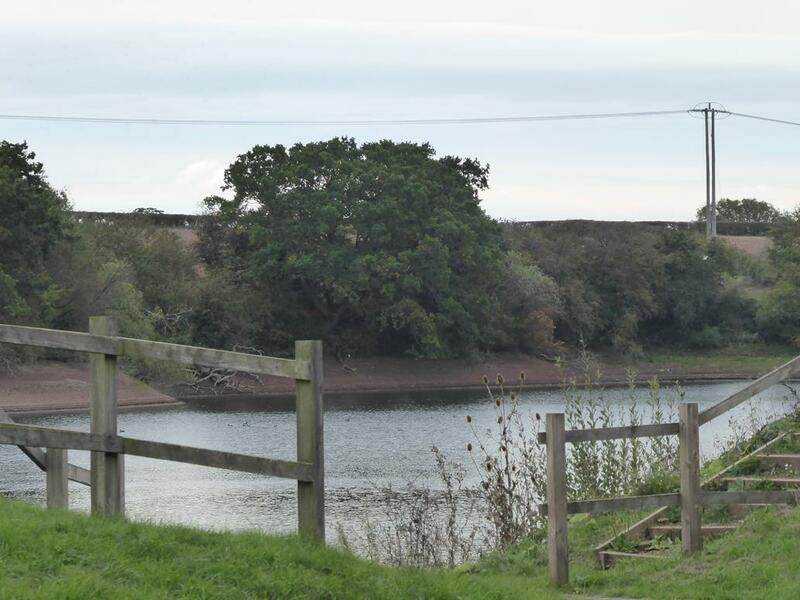 There was one unusual sight near the reservoir - the horse is looking away as they were approaching a van where some fishermen were loading loads of fishing and camping gear and he/she did not like it. 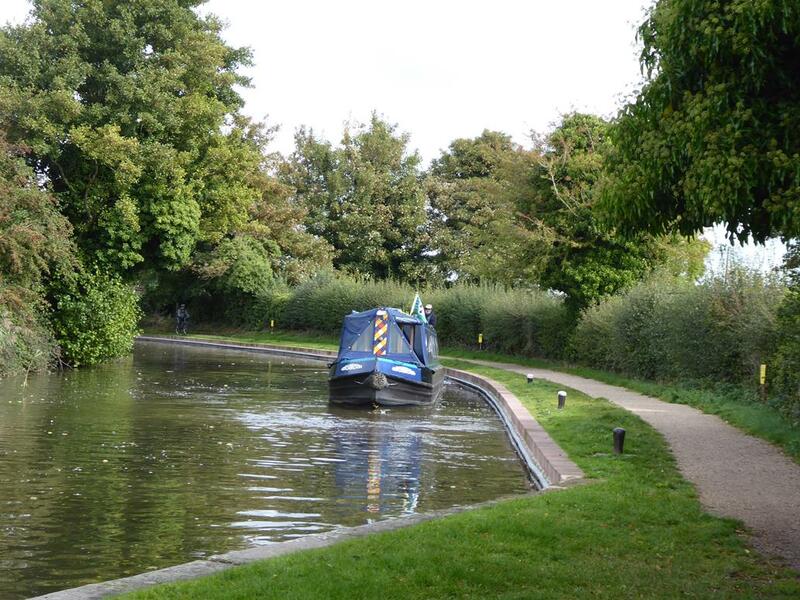 The rider ended up getting off and walking the horse past them - she said she did not fancy ending up in the lock! 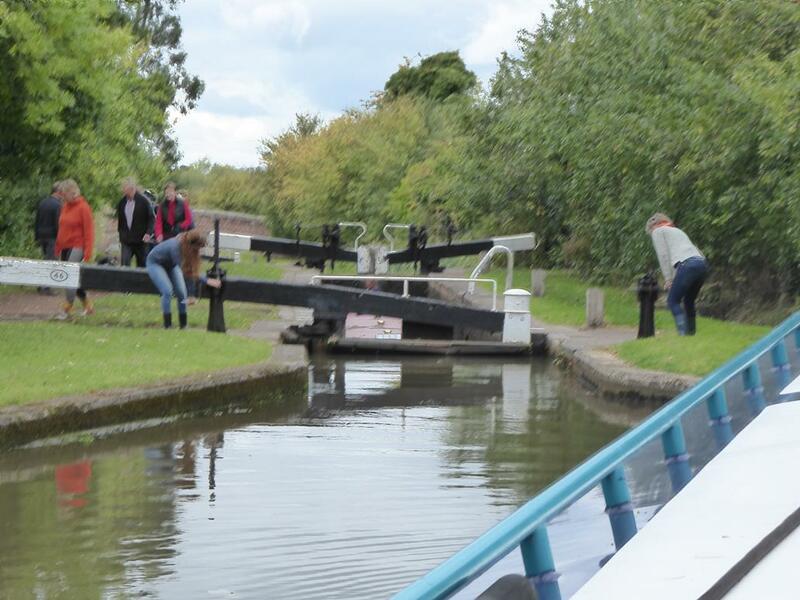 Eventually there was cause for real celebration - lock 57 - just one more to go! Finally we were out of the top lock heading to the water point past the winding hole at the wharf on the left. Chris was left to empty rubbish, yellow water, do the pots and sort the boat out whilst I went to rescue our car. 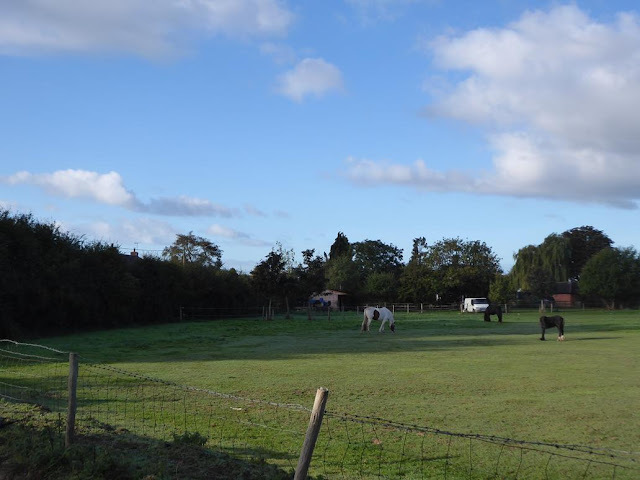 The weather had been amazing - Paul's car said it was 19C as he took Sarah and I back to her car, so she could take me to Droitwich to get ours. We were, as we always are, very grateful for the help, but it also makes a great fun day out, helped enormously by fantastic weather. 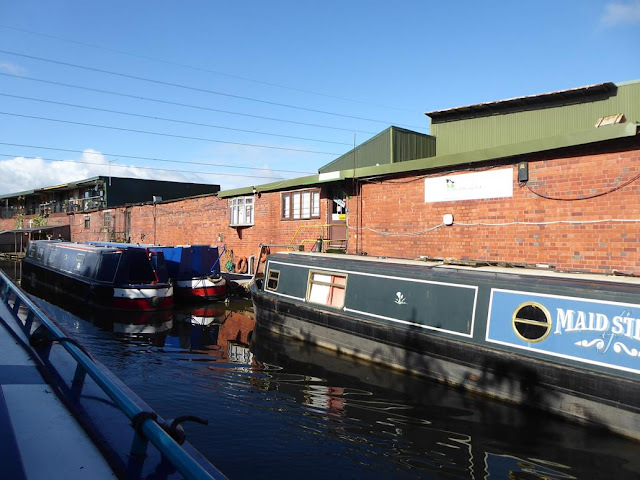 Once I returned with the car we reversed back to moor up near the dry dock (at the back of the winding hole) where we left the boat for Crafted boats to move into the dry dock on Monday). Chris went across today (Monday) to collect the stern hatch so he can rust treat and paint the underside whilst the boat is safely under cover, so that will keep him busy this week. Next week - well she will have to go back down to the marina again. A day we went in different directions. First job was to move across the canal to the water point to fill and empty as required and to take delivery of a Tesco shop. Mid afternoon our daughter, Sarah, came and collected me to take me home where there were jobs to be done - mail to go through and grass to cut to name but two. She returned early evening and we went out for a Mum/Daughter meal out. It was good to catch up with her and even better that she stayed over. Sarah followed me to the Queen's Head and then returned me to Tardebigge. Kiera's owners, Jane and Chris, arrived mid morning to collect Kiera who was over the moon to see them both. They had just one small task to do before they left - there were 'kennelling fees' to pay - a mere 30 locks to negotiate! 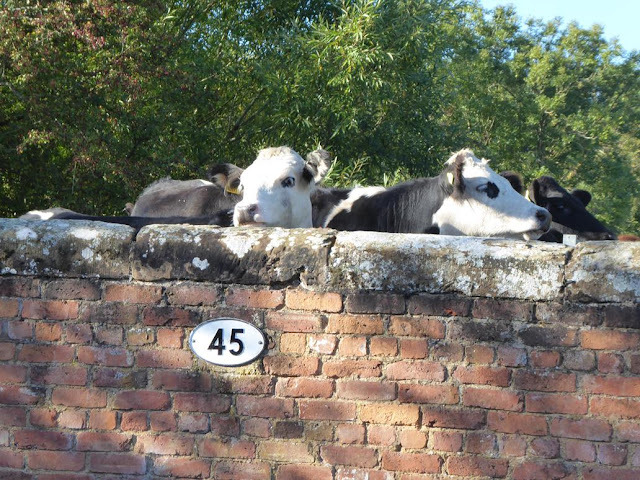 Most locks were against us, but with four on the job it did not present much of a problem. 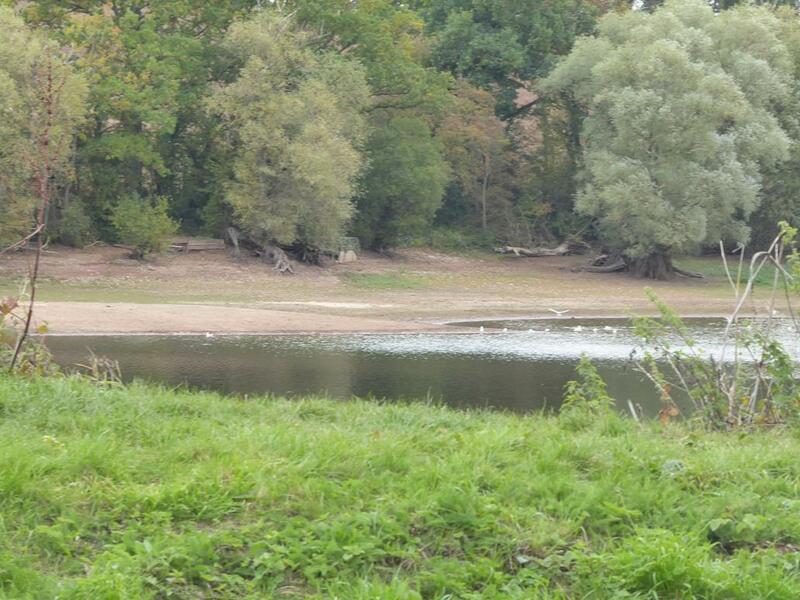 The reservoir is, as you would expect, quite low. It still proved an irresistible draw to Kiera who just had to have three swims! Then there was a group of Bromsgrove Asda employees doing a sponsored walk. If you see this - I hope you all escaped blister free and made a good sum of money. We stopped at one point for a quick sandwich eaten whilst we were in a lock - we needed to eat early as we were booked in to have dinner at 5pm at The Queen's Head. Jane and Chris worked really hard - I only managed one shot of Jane and none of Chris as he was always ahead of us. Just to prove I do exist - Jane took one of me at work! We were obviously both in the pink today! We made the trip in just over 3 hours - not bad for 30 locks. 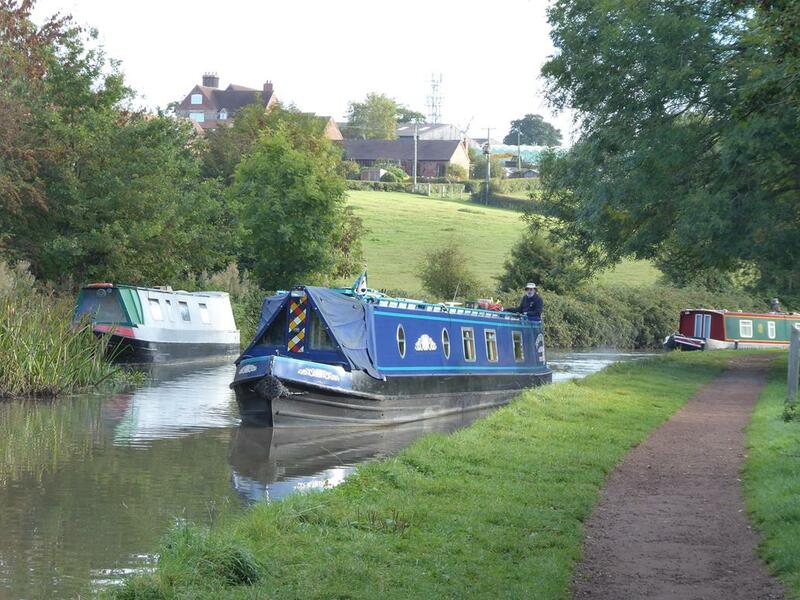 Mind you the second boat we met ascending, the crew of three were taking their second boat up Tardebigge that day. Apparently they did the first in 2.5 hours which is pretty amazing. They were younger than we are by quite a lot of years, so I still think our effort was pretty good. 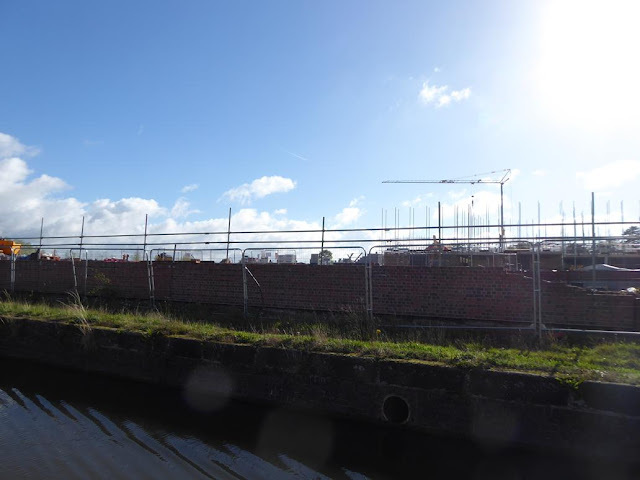 We managed to moor just past the lock landing at the bottom of the locks. It is well away from the pub and, more importantly, from noisy boarding kennels. 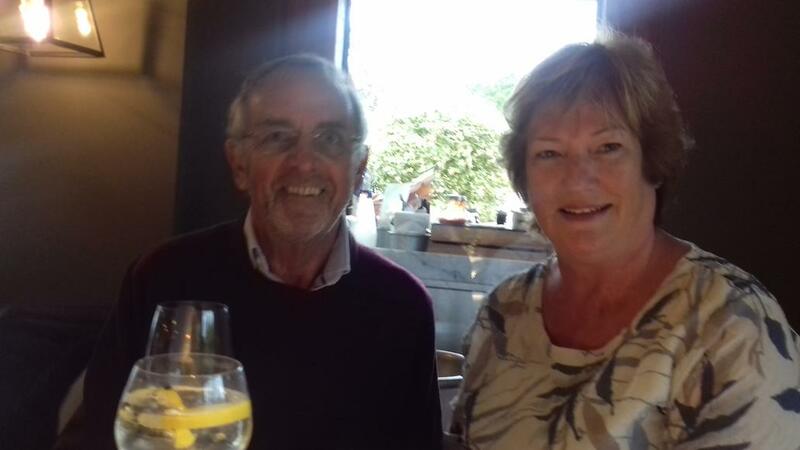 I took Jane back to Tardebigge to get their car, she followed me to Droitwich and then took me back to The Queen's Head - an enormous bonus to have our car in the right place for us tomorrow. The meal in the Queen's Head was excellent - they failed on the delivery of the glasses of wine we had ordered. 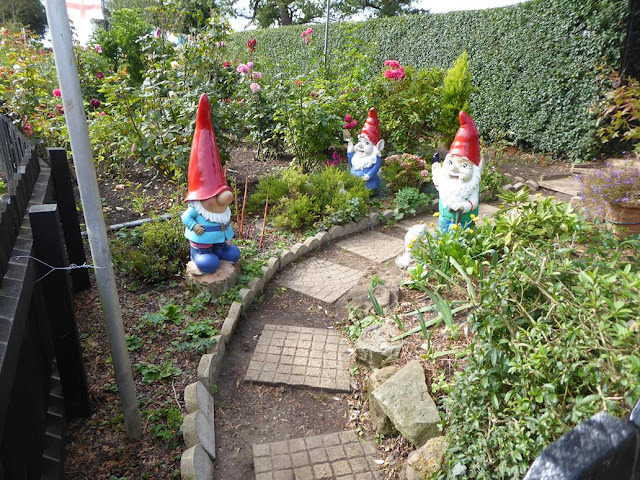 They arrived as we had nearly finished our meals, but to give them their due, they were full of apologies and did not charge us for the wine. It is not the cheapest pub around, but we have never had a bad meal their since it became one of the Lovely Pubs chain. We had a great day together and we are very grateful for their help. Thank you both. After our meal together they left to head home with Kiera. Monty slept all evening, but we are sure he is missing his friend. The two dogs are really good together. What has always amazed me is that they never try to take the other's food. Kiera is welcome anytime - she is a good 'ship's dog'. 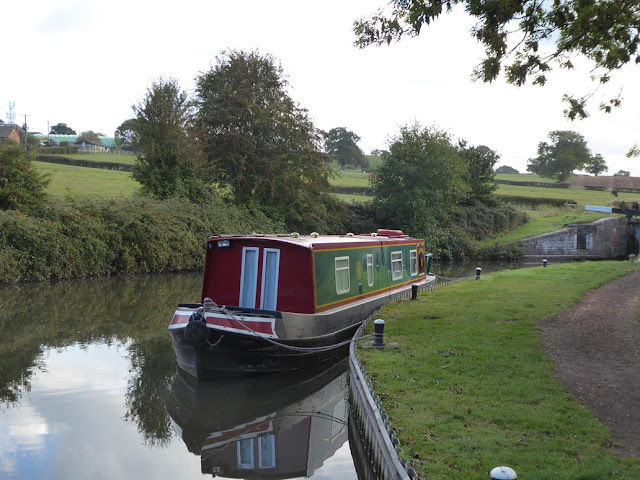 A boat had arrived down the Tardebigge flight whilst we were away having dinner yesterday evening. 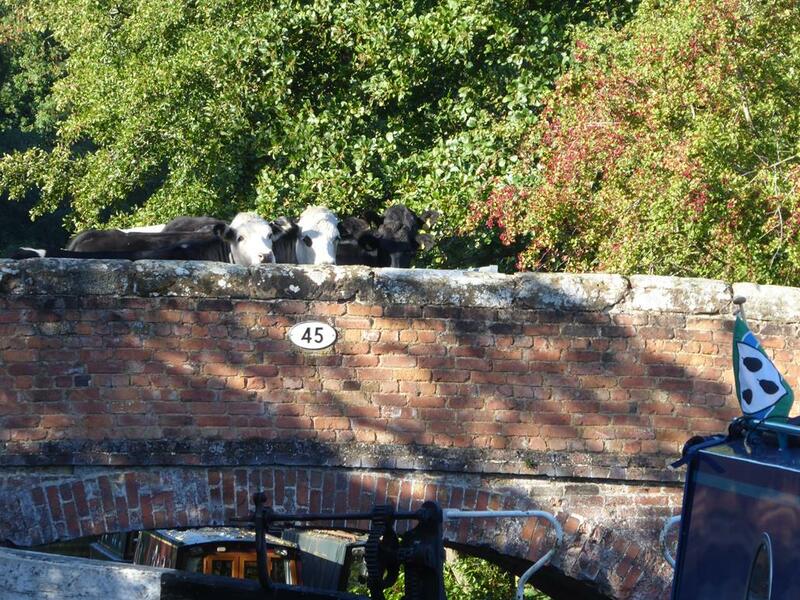 They were moored on the lock landing, so we assumed they were going to go for a quick getaway. 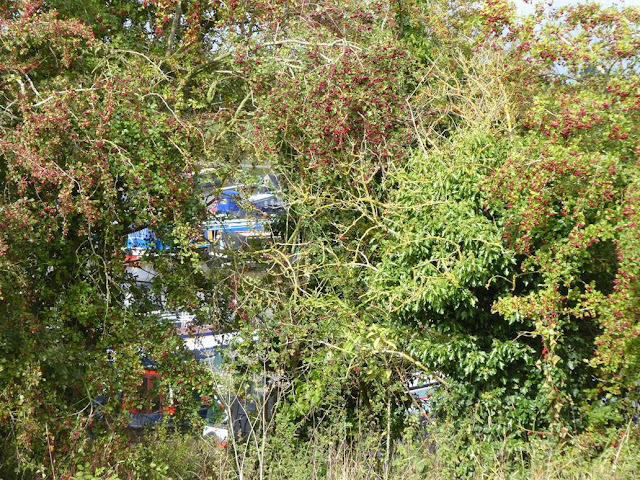 It must have been preying on my mind as I woke around 05:00 having had a bad dream where we were racing with them trying to get to the first lock - the result was we crashed and our boat turned right over. Chris did pop up, but the boat was lost! It was one of those dreams you cannot get past and that was it for sleep until about half an hour before the clock went off! We both heard a boat heading off around 07:30 and assumed it was the boat on the lock landing, so we did not hurry ourselves. 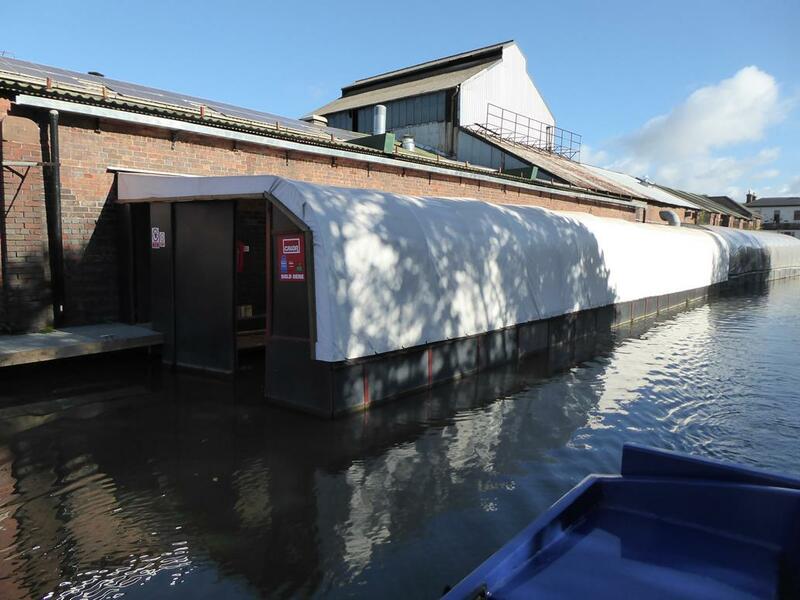 When we emerged about 08:00 the boat was still there and we moved off about an hour later with no signs of life from the boat on the lock landing. 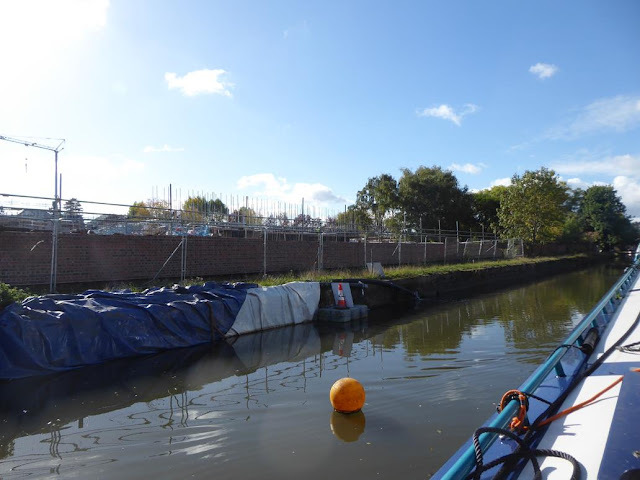 Never mind that the boat had not got ahead of us - the first five locks in the Stoke flight were all against us, so it was never going to be a quick final journey. The sky was blue, the sun was out and we settled down to enjoy this very familiar journey. A first for us - some very different gongoozlers on the Stoke flight! 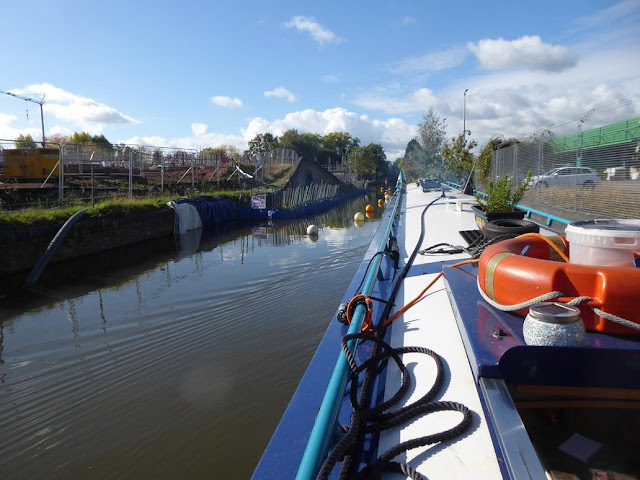 Here we are approaching the first lock at Astwood having just passed a boat, so hopes were high that the locks might be full. 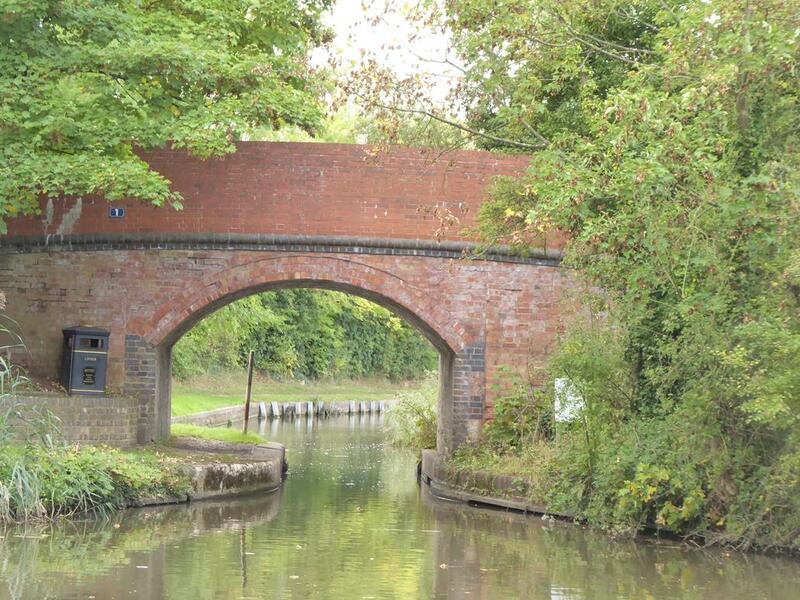 We turn right at Hanbury junction onto the Droitwich canal - we are nearly home! As we are very occasional volunteer lock keepers at Stoke Prior which means we have access to the volunteers' calendar, so we knew there would be two VLKs on duty at Hanbury. This flight of three are very deep, have side pounds and have at least one, usually two VLKs on duty every day. 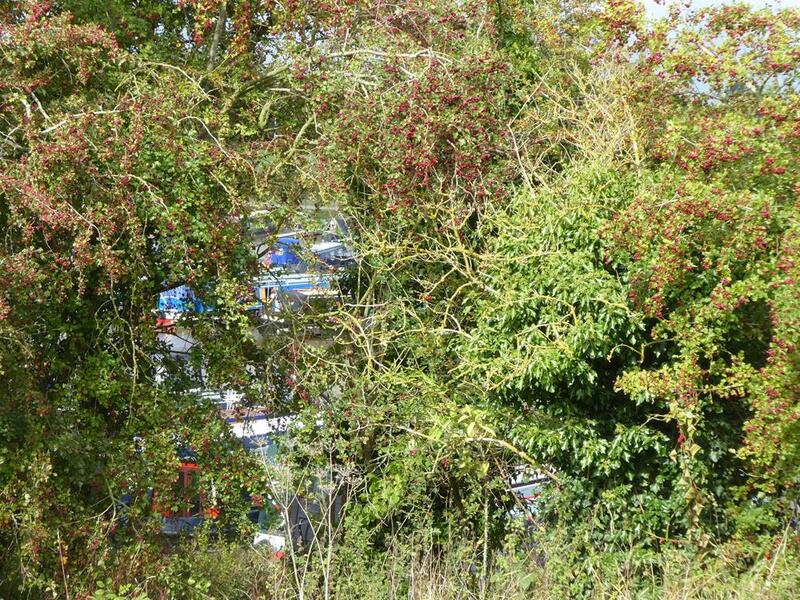 Peeking through the bushes is our marina. Nearly there! We are always grateful for help with these very deep locks and it was not long before we got back to our mooring. A quiet afternoon was on the cards. Tomorrow we start to pack up, load the car and transfer back to our 'winter life'. 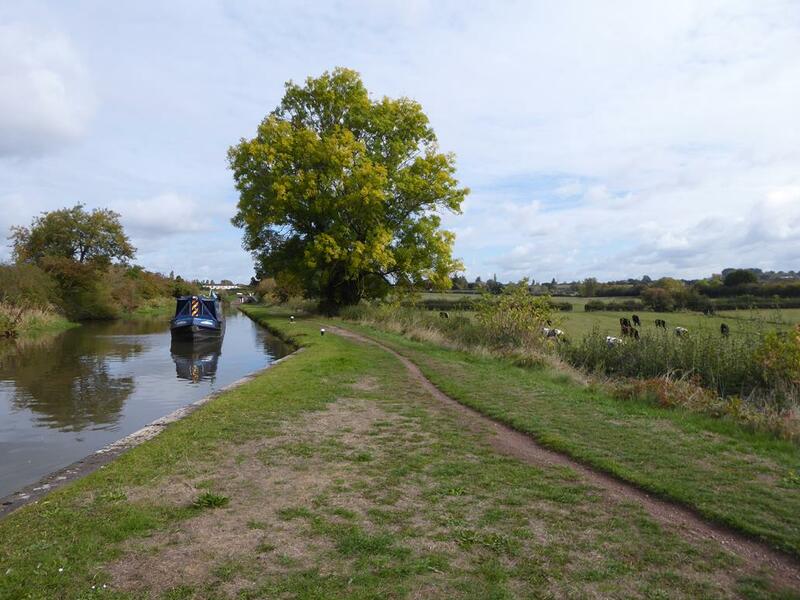 This is not quite the end for the year - we have to take the boat back to the top of Tardebigge to have her bottom blacked for the week beginning 22nd October. Then back again - just another 90 locks to go! under 7 motorways (definitely better than being on them). 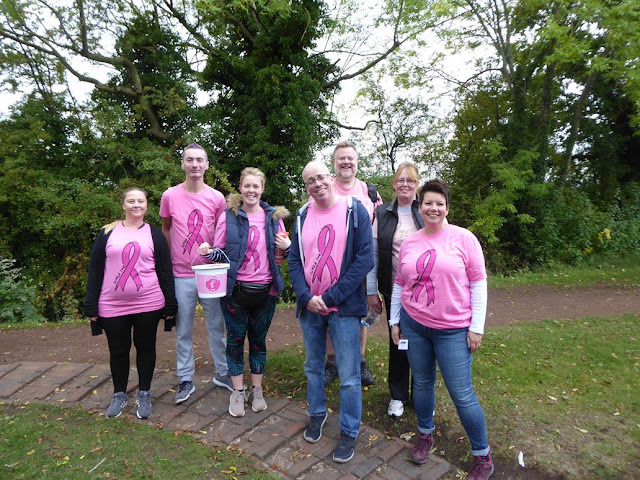 Before we do the trip back up to Tardebigge and back (we are looking for volunteers!) 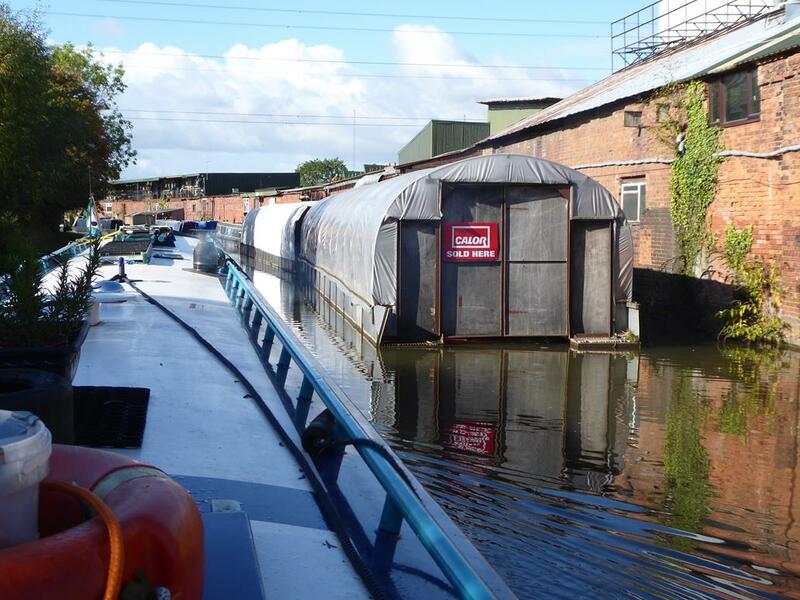 I will work out how many nights we have been on board, the waterways travelled and maybe even the counties. 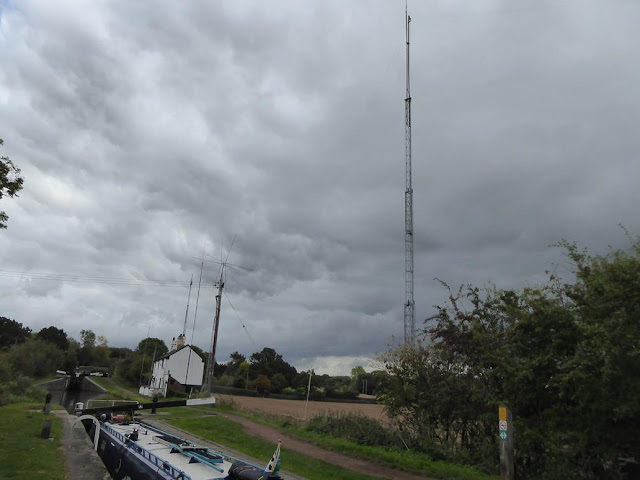 I do know that we have now visited the furthest east on the system (Brandon, Suffolk) having already done the furthest south (Godalming) and the furthest west (Llangollen) - just the furthest north to tick off!